Dental implants are increasingly common and a key factor in their long-term success is maintaining the health of the tissues that support them. The aim of this review was to assess the scientific evidence regarding the risks of implant loss, implant bone loss, and peri-implantitis incidence in subjects with a history of periodontal disease (PD), compared with patients without PD. Searches were conducted in Medline, Cochrane Register of Controlled Clinical Trials, Cochrane Database of Systematic Reviews, Database of Abstracts of Review of Effect, Science Direct, and SCOPUS. These were supplemented by hand searches of a number of relevant journals. Only prospective cohort studies that compared patients with PD to periodontally healthy patients and that reported data on implant loss, peri-implant bone changes, or incidence of peri-implantitis were included. Selection and quality assessment was conducted independently by two reviewers. Three outcomes were considered, implant loss, implant bone loss (IBL) and incidence of peri-implantitis (PI). Dichotomous data were expressed as risk ratio (RR) and 95% confidence interval (CI), while continuous data were expressed as standardized mean difference (SMD), random effects model was used for both type of data. a higher and significant risk for implant loss was present in patients affected by PD (RR: 1.89, 95% CI: 1.35–2.66, P < 0.0002). A higher and significant IBL was present in patients with periodontal disease, when compared with patients periodontally healthy (SMD: 0.44, 95% CI: 0.19–0.69, P = 0.0006). No evidence of significant heterogeneity was detected for the three outcomes. Sub group analysis showed that the risk was increased for patients with aggressive periodontitis (RR: 4.04, 95% CI: 1.81–8.98, P = 0.0006) compared with patients with chronic periodontitis (RR: 1.59, 95% CI: 1.10–2.32, P = 0.01). 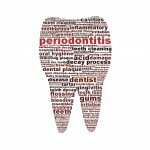 Strong evidence suggests that periodontitis is a risk factor for implant loss; moderate evidence revealed that periodontitis is a risk factor for peri-implantitis and that patients with periodontitis have higher implant-bone loss. While the authors have restricted their inclusion criteria to prospective study designs none of the included studies achieved a maximum score on the Newcastle–Ottawa Scale that they have used to assess risk of bias. As a result suggesting that the available evidence provided strong evidence of periodontitis as a risk factor may be overstating the current position, although, it is clearly important to consider when considering implant placement. Currently the evidence for effective interventions for maintaining or recovering health of peri-implant soft tissues is limited as recent Cochrane reviews by Grusovin et al (2010) and Esposito et al (2012) found. Sgolastra F, Petrucci A, Severino M, Gatto R, Monaco A. Periodontitis, implant loss and peri-implantitis. A meta-analysis. Clin Oral Implants Res. 2013 Dec 31. doi: 10.1111/clr.12319. [Epub ahead of print] PubMed PMID: 24382358. Grusovin MG, Coulthard P, Worthington HV, George P, Esposito M. Interventions for replacing missing teeth: maintaining and recovering soft tissue health around dental implants. Cochrane Database of Systematic Reviews 2010, Issue 8. Art. No. : CD003069. DOI: 10.1002/14651858.CD003069.pub4. Nice to have more evidence of what is seen in the surgery and suspected anecdotally. Regular maintenance and exceptional oral hygiene are essential to any implant patient. Thanks for your web site and regular postings.